It must have been the cluster of red awnings that caught my eye that morning on the train. Heading into the city on a Saturday morning in April I stood gazing out at the passing scenery. A full car meant standing, but I didn't mind as it meant an opportunity to see what was happening. This time of year each ride means a view slightly greener than the last, and it lets me keep an eye on some my favorite rooftop and balcony gardens. It's a nice chance to see what I can't at street level. 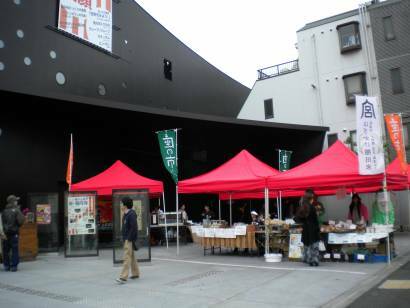 As we passed the Za-Koenji Theatre, a distinctly large brown building, I felt sure those awnings meant a little market. I made a mental note to check it out on my return journey. 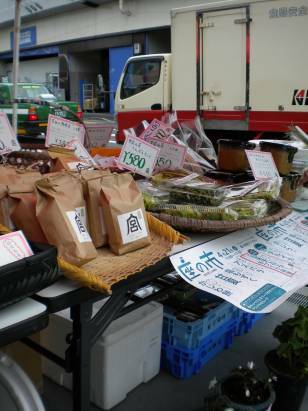 I was already planning to swing by the Kichijoji Farmer's Market, so why not throw this one in, too? Not so crowded this rainy day at the Koenji Farmer's Market. The market, when I did arrive, was definitely small - maybe a total of ten vendors - but lovely. Local growers from Koenji, Nakano, and Sendagaya-ku offered a orange and white carrots, dandelion greens, komatsuna, warabi (a form of sansai that I have not exactly figured out how to prepare yet), and mikan. Another table offered thick slices of quiche while another had some lovely looking baked goods. A small group representing growers and craftspeople from Niigata were special guests that day, and needless to say I came away with rice from Kawaguchi-Araya and some beautiful ceramics. A monthly event, the Za-Koenji Public Theatre started running it about a year ago. According to market manager and theatre staff member, Yosuke Sasabe, the founders of the theatre saw it as a logical extension of their mission. "The organizers of the theatre want to create a place where people can gather and meet," Sasabe said as he gave me a quick tour of the cavernous space with a cafe on the top floor and a huge rehearsal space in the basement. The market then gets added to a long list of public events that include not only plays and musical performances, but workshops, rehearsal space for the famous Awadori dancers, and home to others participating in the three other major festivals that occur in Koenji throughout the year. Directions: Exit Koenji Station to the north and turn right. Follow the road next to the track until you get to the theatre, and start shopping! If it rains, they move everything on inside. This is very cool. I love exploring farmer's markets and chatting with the shop owners. 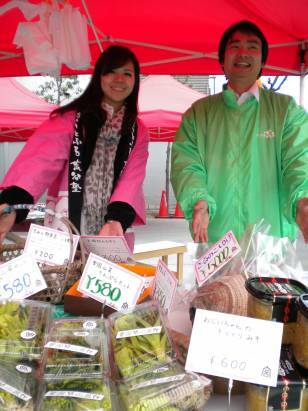 Looks like Japanese farmer's markets are no less interesting (and probably more so)! Quite right. Markets here, as well as the producers and growers that sell at them, are the same the world over, I find. The language is different and the produce changes, but the sentiments are always the same. And it is heaps of fun!